Can't seem to find anyone suggesting this but it seems way easier than soldering a wire/drilling a hole from the thimble holes to the cavity. I've lined the cavities with just copper tape - no soldering - and conductivity, measured via a borrowed multimeter, is perfect throughout, so it seems perfectly logical to just stick some between the cavities and the thimble holes, of course ensuring that the thimbles are tight. No reason not to, but this is exactly the same way as the 'ground wire in bridge thimble' method. 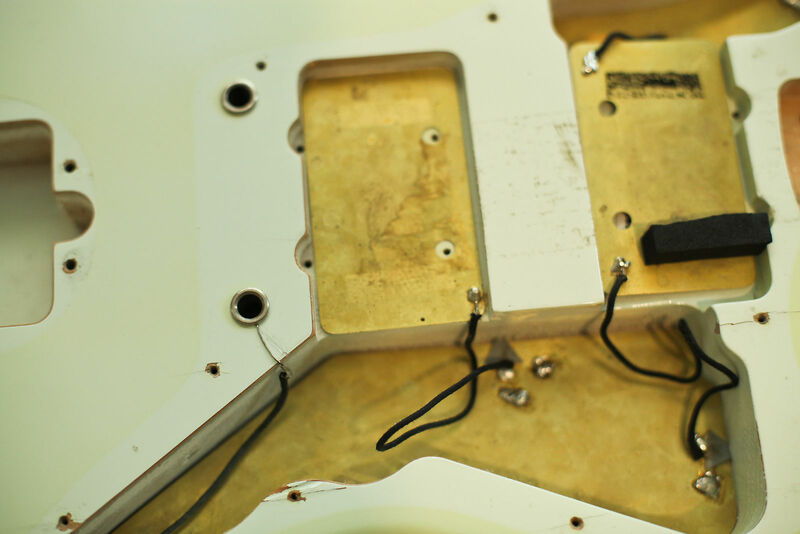 The wire isn't soldered anywhere and no hole drilling is required, it's jammed in the thimble hole then the other end contacts the pickguard shielding when it's installed (and cavity shielding if you so desire and have made the wire long enough). Last edited by andy_tchp on Fri Aug 17, 2018 2:50 am, edited 1 time in total. Ground is ground in a guitar. So yes tape would def work to ground the bridge/strings/trem (assuming metal saddles). But over time the tape could wear through and separate at the bend point where it enters the thimble hole. Or just a short bare wire from the thimble hole sandwiched between the body and surrounding (grounded) pickguard shielding. BTW my trick for easily removing thimbles (to add said wire) is a 6mm expansion bolt. Ok cheers guys, just making sure I'm not missing something obvious. Went with tape, I can't imagine it degrading enough over time, there's no movement to allow it, seems like plenty of contact too. I've done it, works just fine. I have a Jag I built whose right thimble is grounded via the shielding tape I used in the cavity. Check for continuity. Ground is ground. I've also done this with no problems.